Grounding rods are thick metal rods buried beneath the soil's surface and connected via electrical conductors to receivers (lightning rods) mounted on top of buildings, trees, historical monuments, bridges and even ships to protect them from lightning strikes. Protection occurs by redirecting the electrical current from the structure through the electrical conductor into the ground. 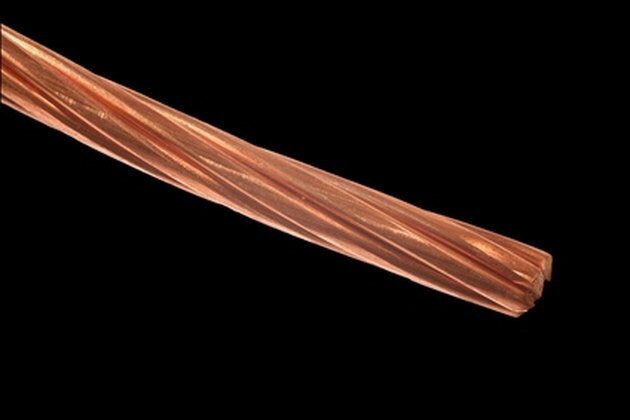 A copper grounding rod is just the subsurface component of a lightning protection system. They are easily installed by homeowners. Dig a small hole in the dirt where the copper grounding rod will be placed. Make the hole approximately 12 inches wide and 12 inches deep. Be sure that your grounding rod location is compliant with the local building code. Fill the hole with water from the garden hose. Place the copper grounding rod in the center of the hole and strike it with a rubber mallet until it penetrates several inches. Pull the grounding rod back out of the hole. Add water to the hole with the garden hose until it is full again. Place the copper grounding rod in the previously started grounding rod hole and strike it again with a rubber mallet until it penetrates several more inches. Pull the grounding rod back out of the hole. Repeat this process until the grounding rod has penetrated to the required depth. When finished, be sure to strike the grounding rod several more times with the rubber mallet without adding any more water so it is firmly seated. Fill the original hole back in with dirt, and pack it down. Attach your electrical ground lead to the top of the copper grounding rod using a code-complaint grounding rod clamp. Be sure to get the clamp as tight as possible.